Eleanor M. Schorer was born on April 13, 1891, in New York City. Her birth date is from the Social Security Death Index and the birthplace was noted on several passenger lists at Ancestry.com. In the 1900 U.S. Federal Census Schorer was the oldest of two daughters born to William and Martha. They lived in the Bronx at 1806 Anthony Avenue. Her father worked in housing construction. The 1905 New York state census recorded the family of four in the Bronx at 1815 Morris Avenue. Foremost Women in Communications (1970) said Schorer studied at the National Academy of Design in 1906. The 1910 census said the Schorers were at 2023 Morris Avenue in the Bronx. 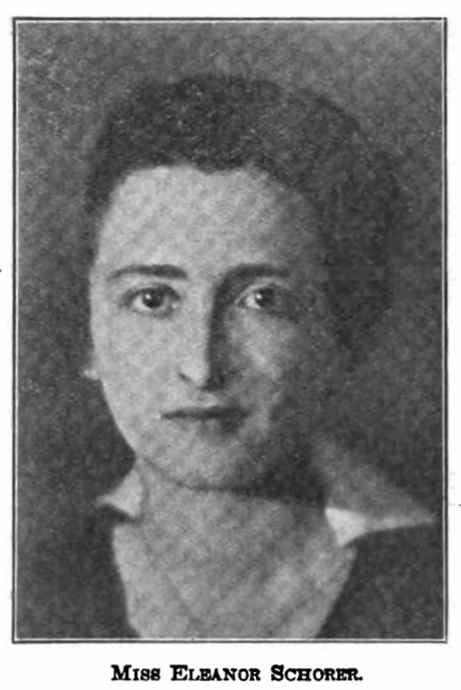 Foremost Women said Schorer found work at the New York Evening World in 1910. American Newspaper Comics (2012) said she worked on over thirty series for the paper including The Adventures of Judy (1926), and The Summer Girl. Pleiades Club Year Book (1912) published a drawing by Schorer. According to Foremost Women Schorer studied writing and English at at Columbia University in 1913. 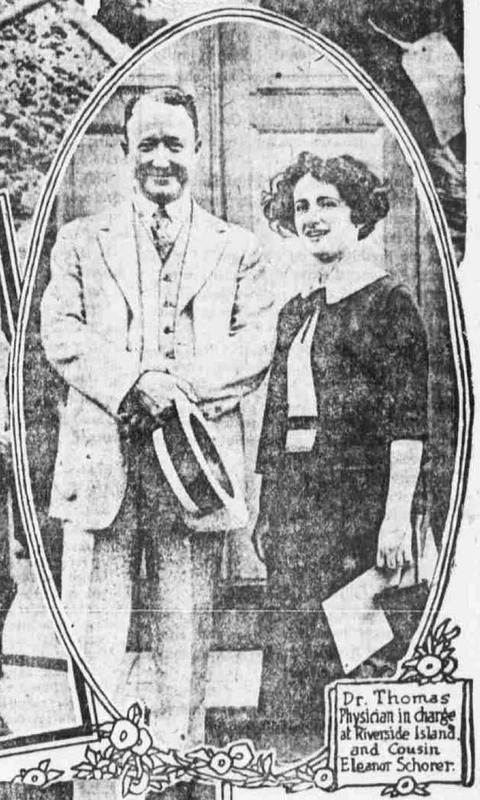 Schorer and her mother returned from Bermuda on April 19, 1914. Their address on the passenger list was 211 Bush Street. In the 1915 New York state census the Schorer family of four lived in the Bronx at 211 Bush Street. Perhaps Schorer’s biggest success was as “Cousin Eleanor” and her Kiddie Klub of a hundred thousand members. Editor & Publisher, March 23, 1918, profiled Schorer and said the Kiddie Klub began in the Evening World on May 1, 1916. Schorer applied for a trademark. The Official Gazette of the United States Patent Office recorded the filing on February 20, 1917. Schorer wrote and illustrated The Wishing Ring in 1919. In the 1920 census Schorer lived with her parents in the Bronx at 2055 Davidson Avenue. Schorer’s occupation was writer in the news industry. Schorer’s marriage to Chester Hope was announced in The New York Times, January 20, 1922. Chester Hope was first married in 1906 to Eva Olivia Collins of Cleveland, Ohio. The first Mrs. Hope died in 1918 and there were no children of that marriage. On January 19, 1922, Mr. Hope was married in New York City, to Eleanor Schorer, the daughter of William B. and Martha Frances (Dohm) Schorer. Mrs. Hope, whose father was a builder, is well known as an artist and writer. The Newspaper Feature Service produced the article, “To Give Their Hearts But Keep Their Names” which was published by subscribing newspapers including the South Bend News-Times and The Oregonian. Below is the paragraph about Schorer. And those of you who know anything about New York must know that there is there a Kiddie Klub which interests thousands of youngsters. It was started by the Evening World, and its fame has reached other parts of the country during the six years of its existence. The originator and director of the “Kiddie Klub” is “Cousin” Eleanor Schorer. She was just a slip of a girl when she started being a “cousin” to all children in the big town. But, when Chester R. Hope, a newspaper editor, recently made her his wife, he agreed that she would not have to quit being Eleanor Schorer. For the children would hardly recognize “Cousin Eleanor” in the person of Mrs. Hope. Schorer and her husband returned from Europe on October 22, 1923. They sailed on the S.S. La Bourdonnais from Bordeaux, France. Their address on the passenger list was 14 East 43 Street, New York, New York. They traveled together in 1927. American Newspaper Comics said Schorer was one of several artists to draw Romantic Cartoons for Newspaper Feature Service, a Hearst syndicate. The series started with Gustav Michelson on December 8, 1913. In 1925 Eleanor drew the series under the name Eleanor Hope. Schorer and her husband have not been found in the 1930 census. Schorer was aboard the S.S. Europa when she departed Cherbourg, France on April 17, 1930. She arrived in New York City five days later. Her address was South Mountain Road, New York City. Foremost Women said Schorer studied at the Art Students League, and Julian’s Academy (Paris) from 1930 to 1931. 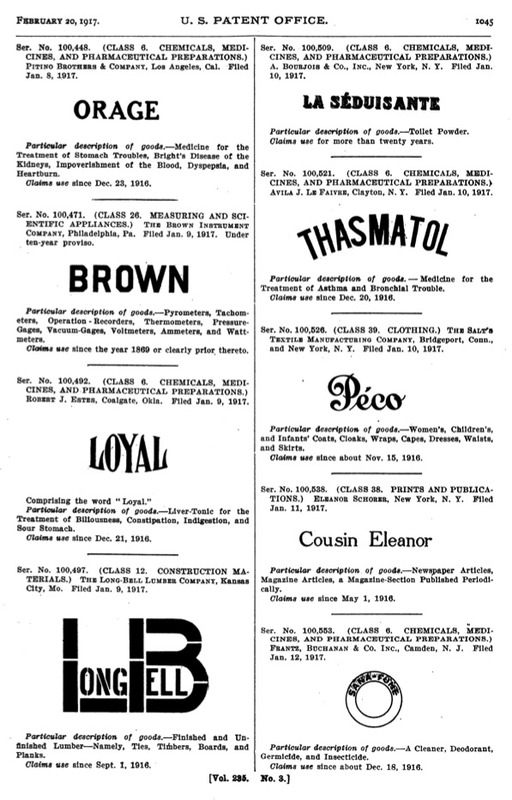 Foremost Women said, starting in 1931, Schorer’s chief clients were the Philadelphia Inquirer, St. Louis Globe Democrat, and the Toronto Star. The Orangetown Telegram and Pearl River Searchlight (New York), August 1, 1947, reported on the newly organized Rockland Chapter of the Business and Professional Women's Clubs. Schorer was elected the Education and Vocations officer. Hope passed away, at home, on November 27, 1963. His death was reported in the New York Times the following day. Schorer passed away on February 24, 1976, in Palm Beach, Florida, according to the Florida Death Index. She was laid to rest at Arlington National Cemetery. That's not a patent; that's for trademarks. Run by the same department (the U.S. Patent & Trademark Office, and its predecessors), but governed under different law. You can tell, because of the references to classes and the kinds of goods and services. I used to practice trademark law, and I see very often folks conflating the two terms.